Most of the North American pinyon pines are species of Pinus subsection Cembroides. This group of pines are distributed from the western United States to south-central Mexico. The species are recognizable for adaptations for bird dispersal, notably enlarged, functionally wingless seeds with a hardened integument. Other pine subsections (Nelsoniae, Strobus, and Pinaster) also have wingless seeds, so this character is not diagnostic for the group. 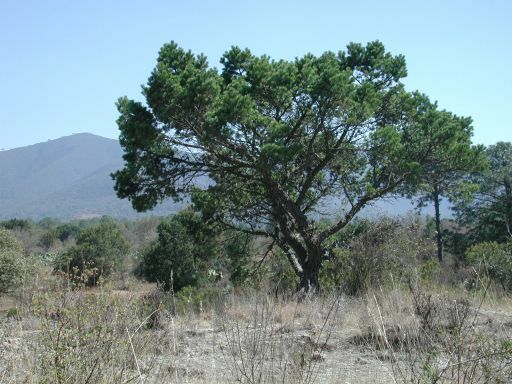 Furthermore, the rare Mexican endemic, P. rzedowskii is also in subsection Cembroides, although it has small, winged, wind-dispersed seeds as in most other pines. Farjon, A. & Styles, B. T. 1997. Pinus (Pinaceae). Flora Neotropica Monograph 75. The New York Botanical Garden, New York. Gernandt, D. S., A. Liston, and D. Piñero. 2001. Variation in the nrDNA ITS of Pinus subsection Cembroides: implications for molecular systematic studies of pine species complexes. Molec. Phyl. Evol. 21:449-467. Gernandt, D. S., A. Liston and D. Piñero. 2003. Phylogenetics of Pinus subsections Cembroides and Nelsoniae inferred from cpDNA sequences. Syst. Bot. 28:657-673. Liston, A., D. S. Gernandt, T. F. Vining, C. S. Campbell and D. Piñero. 2003. Molecular phylogeny of Pinaceae and Pinus. Pp. 107-114 in Mill, R. R. (ed. ), Proceedings of the International Conifer Conference. Acta Hort. No. 615, International Society for Horticultural Science, Brugge. Malusa, J. 1992. Phylogeny and biogeography of the pinyon pines (Pinus subsect. Cembroides). Syst. Bot. 17:42-66.